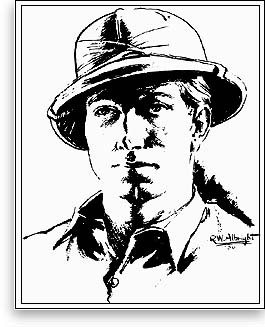 Included in the stuff of adventure that marked Rons Puerto Rican expedition was a near fatal collapse of a San Germán mine shaft. Eventually part of the fodder for a celebrated collection of stories appearing in Argosy magazine and known as The Hell Job series, we present the Argosy note on the incident as reported to readers in 1936. Ron Hubbard, author, adventurer, aviator, and ex-marine, almost lost his life in securing data for his Hell Job series of dangerous profession stories now running in Argosy weekly. While inspecting a mine at San Germán, Puerto Rico, he came closer to death than any of his fiction heroes. In order to look over an abandoned mine it was necessary for Hubbard and a native helper to squeeze through a half-caved shaft which was held by rotting timbers. Dirt rattled off the walls and down his neck. Everything was silent except the scratch of hobnails. Then suddenly he felt the timber caving in on him. He threw himself down. The candle went out. He got on his hands and knees pushing his back against the wall trying to keep himself from being buried alive. Dirt rattled. For agonizing seconds he stood there in the dark waiting to be crushed. No crews were outside to dig him out. With terrific concussion the roof dropped ten feet up the drift. Anxiously he crawled back and forth trying to find a way out. There was none. The timber he had been supporting leaned inward and then dropped, half burying Hubbard and the native. He could barely breathe. He couldnt see. He awaited death that might be days in coming. More than an hour passed. Finally he heard something scratching. Hobnails on the next level. Hubbard yelled and rescue was then a matter of seconds. There was a stope almost above him. A line was lowered. Anxious natives had worried over Mr. Hubbards absence and had come investigating.